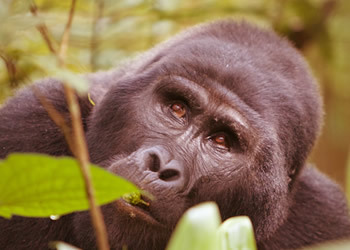 5 Days Best of Uganda wildlife safari starting off with gorilla trekking in Bwindi impenetrable forest national park and wildlife viewing in Queen Elizabeth national park. The tour to quuen Elizabeth entails grame drive in the park to view wildlife like Elephants, kobs, lions and a launch along the Kazinga channel offering upcose view of water animals like hippos, birds. A visit to Bwindi national park not only rewards you with mountain gorilla tracking but also visit the Batwa pygies communities as you learn about their ancient culture. What is included in this safari? After breakfast at your lodge around 07:30am in the morning your driver/guide picks you up for a full day private transfer to Bwindi impenetrable forest national park, southwestern Uganda. On the way you’ll stop at Mpampaire village to learn different types of African drums such as Engalabi. Make another interesting stop for photos at equator in Masaka district and have lunch at Igongo cultural museum. Afterwards continue via the rolling kigezi hills arriving in Buhoma late evening for dinner and overnight stay at Silverback lodge/Buhoma lodge/Buhoma Community Rest Camp. After early morning breakfast, you must attend briefing at the gorilla center to know gorilla rules and the gorilla family you’re trekking. Professional guide assures you 99% chances to enjoy an exciting full hour encounter with gorillas no matter the hours it will take to locate them. After encounter with gorillas, you’re awarded a gorilla trekking certificate and lunch is served at the lodge. In the afternoon you can visit the local community including BaTwa pygmies to learn their culture and gorilla revenue sharing benefits such as bee keeping, weaving, craft making and commercial farming. Return for dinner and overnight at your lodge. After breakfast enjoy unforgettable morning nature walk with your guide to the refreshing waterfalls expecting to view butterflies, primates, birds, orchids, tree ferns, flowers. Return for early lunch and transfer to Queen Elizabeth national park. 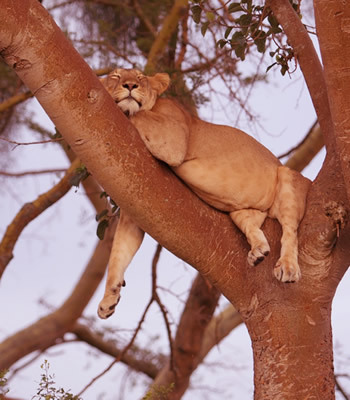 En route you’ll stop in Ishasha wilderness to search for the fascinating tree climbing lions as well as other animals like bush bucks, warthogs, Uganda kob, and eland. You’ll arrive at your lodge with sunset views. After dinner, you’ll do a night bush with a ranger using a spot light to view nocturnal animals like leopard, hyenas, jackals and night jars. Enjoy star gazing as you return to your lodge. Accommodation: Mweya safari lodge (luxury), Katara logde (luxury), Bush lodge (mid-range), Simba safari camp (mid range). After a cup of coffee at 06:30am in the morning enjoy 2-4 hours game drive with high chances to encounter lions, leopard, spotted hyenas, Cape buffalo, giraffe, giant forest hogs, bush bucks, Uganda kob, topi, eland and many species of birds. Return for breakfast and relaxation for lunch. In the afternoon enjoy 2 hours boat cruise on kazing channel to view hippos, crocodiles, elephants, buffalo, and various water birds like pelicans, kingfishers, African fish eagle, egrets and herons. Return to your lodge for dinner and overnight. After breakfast, you depart Queen Elizabeth national park via Mbarara. You’ll have lunch en route and visit Igongo cultural museum. Continue to Kampala reaching in the afternoon. You may Gadaffi mosque to have aerial views of Kampala city and after transfer Entebbe airport.